• The game between Washington State and Arizona State was entertaining, suspenseful and fun to watch. But the handshake between the two coaches afterward gave it a touch of drama. Soap opera-level drama, sure, but drama nonetheless. If you missed what happened last week, Leach expressed his disgust with Arizona State and its conference-wide reputation for stealing opponents’ signals. 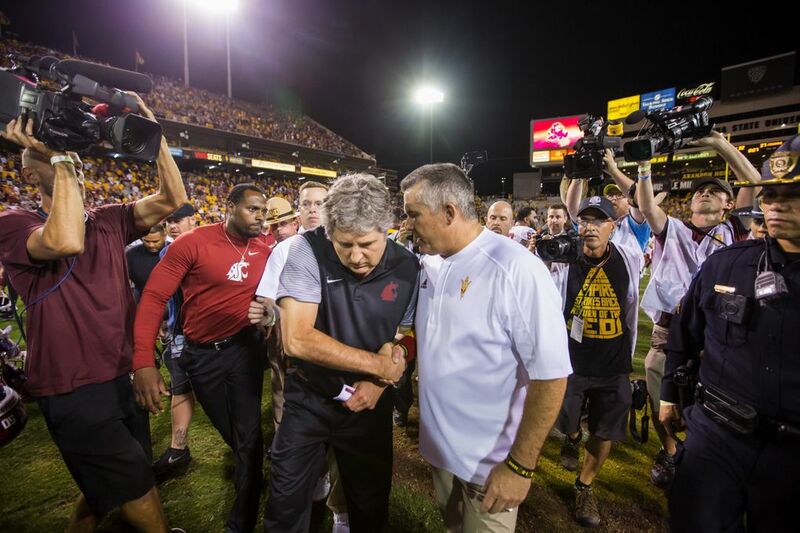 Do the Sun Devils go above and beyond the usual and venture into the realm of rule-breaking? Maybe, but no one has proved it. Leach insinuated they do. He said enough to cost him $10,000 and a reprimand from the Pac-12. The conference’s action made Arizona State happy, with everyone from the school’s president to the head of athletics commenting on it. Everyone, except the football coach. He saved his comments for after the game. During the traditional handshake. On national television. And used barnyard language. Used words I won’t use here. Locker room words, maybe, but still enough I’m sure to earn a $10,000 fine from the Pac-12. After all, such comments don’t reflect well on the conference or another conference member. That seemed to be the thrust of the Pac-12’s actions against Leach. So, unless Larry Scott wants to earn a reputation for inconsistency, he’ll probably have to ding Graham. Which is OK. Maybe he can take the fines and dole them out to the rest of the conference members. Fine enough coaches and the money just might make up for not having DirecTV in the fold. It’s a win-win. But you know who loses, again? The fans. Coaches already are hesitant to talk in anything but clichés about the game and their opponents. The threat of a fine – Leach went all Marshawn Lynch after the game but did, in the postgame radio interview, say he’s still waiting for guidelines for what he can say – will only make them hunker down in their command centers even more. • WSU: The game itself followed a usual pattern for the Cougars. A slow start, some near-perfect football in the middle and then a hang-on-for-your-life fourth quarter. The result this week: A 37-32 WSU win. Jacob Thorpe was in Tempe and has a lot, including the game story, a notebook, stars, key moments and scoring. He also has postgame interviews with Leach, quarterback Luke Falk, who was sacked seven times and banged up late in the game, Isaac Dotson, Robert Taylor, who had the Cougars’ first kickoff return for a touchdown since 2003, and Gabe Marks. ... Stefanie Loh also has a game story and a notebook in the Times. ... From the Phoenix area, we can pass along a column, the game story, a sidebar on the handshake (linked above), ASU’s injuries and more. Elsewhere in the Pac-12, Washington continued its undefeated season with an easy 41-17 win over Oregon State. The Huskies head to Salt Lake City next week to face Utah. ESPN’s GameDay will also be there. ... The Utes have lost just once, thought they had to outscore a Josh Rosen-less UCLA 52-45 to stay that way. ... Colorado also has just one conference loss after getting past punchless Stanford 10-5 on the road. ... California and Oregon played Friday night while USC and Arizona had byes. • Gonzaga: Santa Clara will have a new (old) basketball coach this season and Herb Sendek bears a resemblance to another conference coach. ... The volleyball team swept Portland last night. • EWU: The Eagles also followed a familiar script yesterday, with the game at Montana State tight in the first half and a blowout in the second. Eastern won, 41-17. Jim Allen was in Bozeman and has this game story and a notebook. ... Around the Big Sky, rivalry games are supposed to have dramatic endings and Weber State’s 37-36 win over Southern Utah had just that. ... Northern Arizona pulled off the upset of the conference season thus far, defeating No. 10 Montana 45-34 in Flagstaff. ... Road wins are always big. North Dakota picked up one, 28-21 at Idaho State. ... Cal Poly got past UC Davis, 21-16. • Idaho: The Vandals were intercepted three times at Appalachian State and lost 37-19. ... Idaho will induct a whole bunch of folks into its athletic hall of fame. • Whitworth: Eighth-ranked Linfield opened a big lead over Whitworth at the Pine Bowl yesterday afternoon and held on for a 45-31 Northwest Conference win. Tom Clouse has the game story and Tyler Tjomsland the photographs. • Chiefs: Spokane’s six-game Eastern Conference road trip isn’t starting out well for the Chiefs. They lost their second game, 6-0, at Brandon. ... Elsewhere in the WHL, Everett held on for a 3-1 win at Victoria. • Preps: Lake City was better at penalty kicks and that was the difference as the Timberwolves won the 5A girls State soccer title. Greg Lee has the story. ... Greg also has the story of the Coeur d’Alene boys, who lost the final 3-1 to Boise. ... North Central continued its cross country dominance at districts. ... Tom Clouse has an interesting piece on a touching moment in a small school game recently. • Seahawks: The Arizona Cardinals are desperate for a win. They are at home tonight against Seattle. So who wins? Who knows? But it should be fun to watch. • Sounders: The Sounders must win today’s home match vs. Real Salt Lake to advance to the playoffs.